Robyn Sykes is not your average rhyming poet. A flick of her pen makes words twist, tuck and double-somersault with pike. 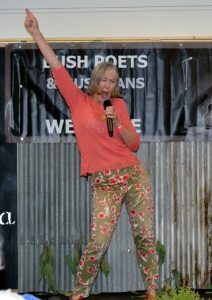 Poems prance. Ditties dance. ‘I love to entertain’, the multi-award-winning poet says. ‘And I love telling stories. I’m delighted to be part of the Cobargo Folk Festival.’ The Australian Champion bush poet learnt to say ‘Banjo Paterson’ before she said ‘Mum’ or ‘Dad’… well not quite, but you get the idea. Buckle up for the ride as Robyn takes her audiences on a high-impact tour through life in modern Australia.